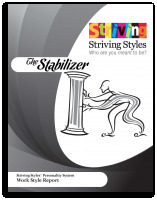 The information in this report will provide you with powerful insight into your unique Work Style. You’ll learn about your Work Style and build awareness and understanding of the inner impulses, attitudes and behaviors which influence your Work Style. Order our Work Style Report and you will see that you can choose the behaviors that are most likely to move you toward desired outcomes at work and get your needs met today!